Imagine you were the apprentice to the Vatican chef and then inherited all of his recipes and other writings as well as his position. You would think your future was secure, but in sixteenth-century Rome, no one was safe from plotting and rivals and everyone had secrets. This is what Giovanni discovers after his uncle and mentor, the great chef Bartolomeo Scappi, dies in Rome on April 14, 1577. Word traveled fast at the Vaticano, even during the darkness of night. Within an hour of Bartolomeo Scappi's passing, serving women from all over the palazzo had come to the chef's bedside, crying for the man they had loved and respected. They keened and wept, tearing at their hair, their skin and clothing, their wails filling the gilded halls. Franceso Reinoso, the Vaticano scalco, ordered the staff to bring candles, and soon they filled the room with their glow, lighting up the shadows and illuminating the faces of the mourners. As papal steward, Franceso always kept things in order, even when his best friend was before him on the bier. Circumstances: After Bartolomeo Scappi, chef to the popes, dies, his nephew and apprentice, Giovanni, inherits everything, but he is told he must burn Scappi's personal journal and letters, without reading them or revealing their contents. Of course, Giovanni cannot help but look, and once he breaks his uncle's encryption, he learns of Bartolomeo's hidden life. The book is told along two time lines—Bartolomeo's and Giovanni's—and both are filled with family infighting, mystery, secrets, politics, murder, jealousy, and romance. The book is ripe with period details, individuals from history, and lots of social and political intrigue. Throughout the novel, of course, are wonderful descriptions of food and menus and the distinctive flavors of Renaissance Italy. Something to know: Bartolomeo Scappi was a real person. He was indeed a famous Renaissance chef who cooked for the popes and who wrote a popular cookbook. Not much is known about him, but I enjoyed King's vision of Bartolomeo's rise to fame. Meet the author: Visit King's website to learn more about her, Bartolomeo, and 16th-century food and cooking. 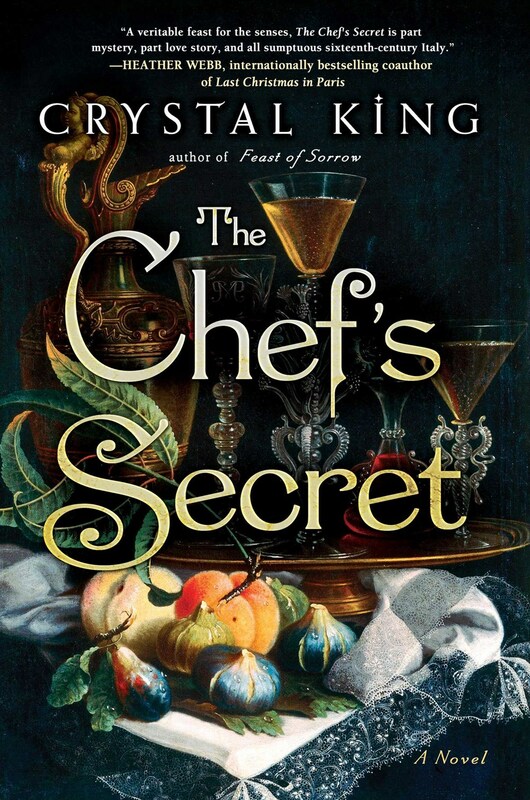 Exciting Extra: Crystal King put together a PDF cookbook with more than two dozen recipes inspired by The Chef's Secret. Some are adaptations of ancient recipes and some are modern dishes that would easily fit in one of Bartolomeo's menus. I was thrilled when Crystal asked me to contribute a recipe, and I had fun coming up with the perfect dish (hint: it's a dessert). I am giving away a PDF copy of the cookbook to every person who participates in my Weekend Cooking link-up on February 16 or 23 or who leaves a comment on one of those posts (I'll include a form that you can fill out in those posts). Open internationally. I hope to see you there! Acknowledgments: Many thanks to Crystal King for the advanced reader copy of The Chef's Secret and for the opportunity to contribute to the accompanying cookbook. Love the cover but based on time period I'm just not sure. Hope you like it! This is definitely making me curious, purely because it seems like nothing I've read before! Vatican politics? My mom would be all over this book. I love reading about 16th century Vatican politics - seamier even than current U.S. politics - (hard to imagine!) This sounds great! Oh wow. I know nothing of the time period or the setting, but sounds like a fun way to learn! It's an okay beginning, but I want to know about the recipes. Hope they're good ones. This sounds just the sort of book I love - it's now on my wish list! I love the cover. And though I don't usually read stories set in the 1500s this one sounds intriguing. Thanks for stopping by Girl Who Reads. I've seen this book around. Looks very good. Not in our library system yet, but I'll look forward to reading it; sounds intriguing. I really enjoyed her earlier novel, set in ancient Rome, Feast of Sorrows. We did that one for Cook the Books Club.